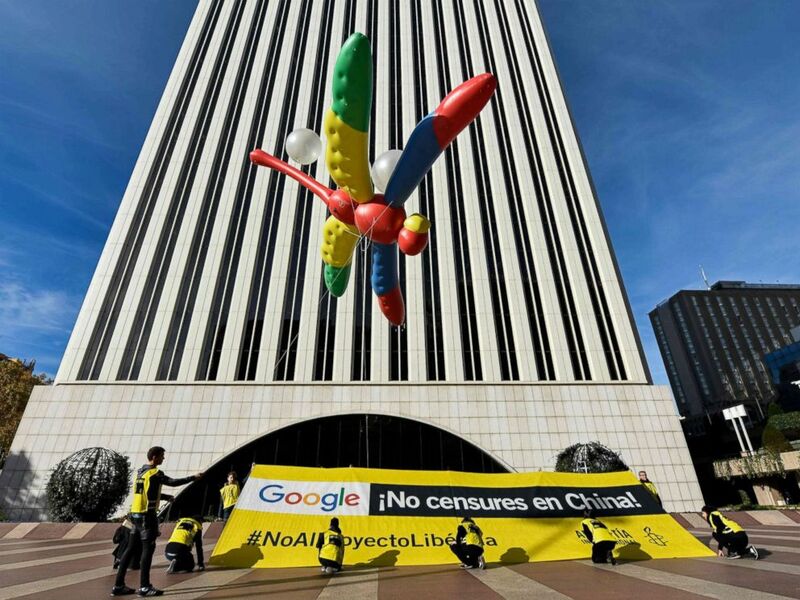 In the latest example of Silicon Valley workers trying to change corporate policy, Google employees opposed to the company's plan to develop a censored search engine in China have publicly called on the company stop developing "Project Dragonfly." "We are Google employees and we join Amnesty International in calling on Google to cancel project Dragonfly, Google's effort to create a censored search engine for the Chinese market that enables state surveillance," hundreds of employees wrote in an open letter published on Medium on Tuesday. 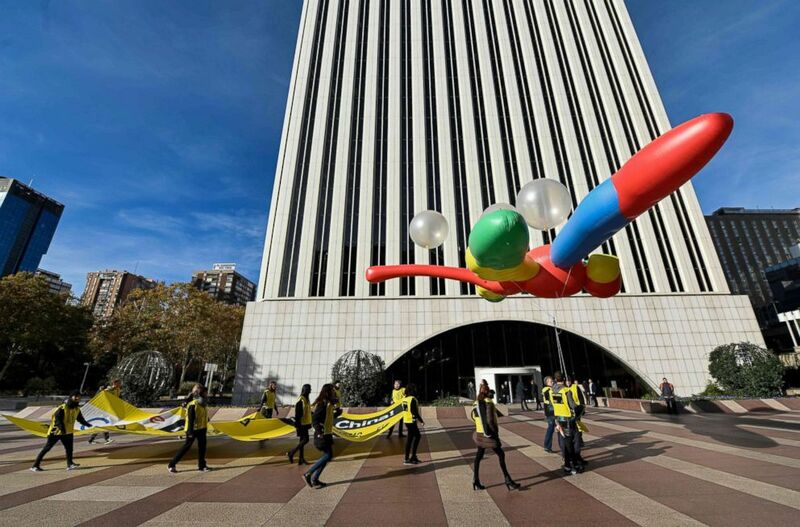 Amnesty International activists hold a giant dragonfly-shaped balloon with a banner reading "Google, do not censor in China, no to the Dragonfly project" during a protest outside the Google headquarters in Madrid, Nov. 27, 2018. "Dragonfly in China would establish a dangerous precedent at a volatile political moment, one that would make it harder for Google to deny other countries similar concessions," the letter continued, voicing concern about Beijing's suppression of the country's Uyghur minority, women’s rights advocates, and students. "Providing the Chinese government with ready access to user data, as required by Chinese law, would make Google complicit in oppression and human rights abuses." The letter was published Tuesday morning with 11 signatures. As of Wednesday morning, there were over 300 signatures, many of whom were engineers. "We've been investing for many years to help Chinese users, from developing Android, through mobile apps such as Google Translate and Files Go, and our developer tools. But our work on search has been exploratory, and we are not close to launching a search product in China," a Google spokesperson wrote in a statement to ABC News. Banned searches on the Chinese internet include references to the "three Ts" -- Taiwan, Tibet and Tiananmen Square, and the pivotal date June 4, 1989, also known as 6-4, when Chinese troops cracked down on pro-democracy activists in Tiananmen Square. Even Winnie the Pooh is banned, as the beloved children's literature character is often used as a codename for President Xi Jinping, who netizens say resembles the bear. "Christopher Robin," a recent film adaptation of Pooh author A.A. Milne, was in fact banned in China. "Project Dragonfly" has been criticized by human rights groups and U.S. politicians since news of its development leaked this summer. In August, thousands of Google employees signed a similar letter. News of the Android phone-based app was first reported by The Intercept. "The question is: What price is worth cracking that market? Is the price going to be accepting just the incredibly egregious censorship the PRC [People's Republic of China] puts on information?" Martin S. Flaherty, co-director of the Leitner Center of International Law and Justice at Fordham Law School, told ABC News. "So far, Facebook has not delved into it yet, and it looks like Google is at least dipping its toe in the water." Google previously operated a censored Chinese search engine from 2006 to 2010. After it was revealed that the government was using Google's server to hack into the accounts of and track Google employees, the company moved its server from mainland China to Hong Kong. "Apparently Google is now considering moving its server back into China and essentially taking on some of the censorship," Flaherty said. Presently, a Google.cn search will route to a Hong Kong server and the url: google.hk. Earlier this month, 20,000 Google employees staged a walkout to protest the company's handling of sexual harassment accusations after a New York Times report found that the company paid male executives accused of sexual misconduct exit packages of as much as $90 million. A week later, the company changed its policy and ended forced arbitration to settle sexual misconduct claims. In doing so, Google joined Microsoft, Uber and Lyft in waiving forced arbitration in sexual harassment and assault cases. Facebook also changed its policy. Many employee advocates argue that ending forced arbitration, which usually imposes confidentiality on the parties involved, is the first step toward ending sexual harassment in workplaces.